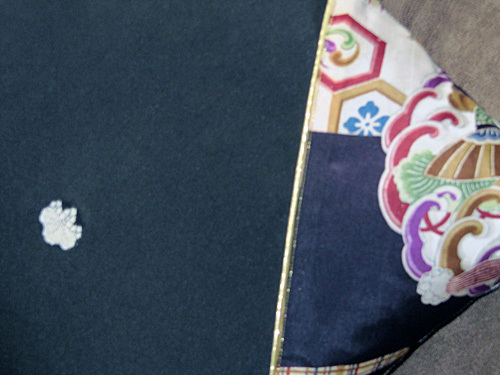 A Japanese woman’s most formal Kimono is the black “Tomesode” with the requisite Family Crests or “Mon.” It receives its name from the length of its sleeve, the ultimate arbitrator of a woman’s age in Japanese society. 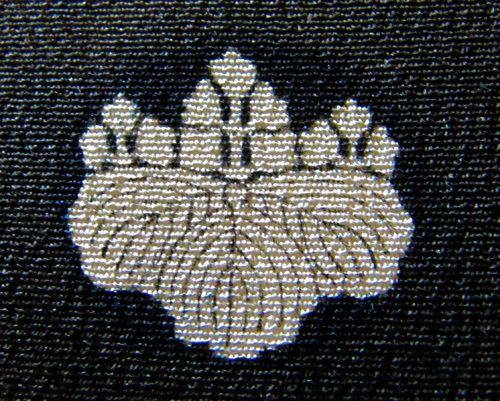 The Tomesode which was the name of the shorter sleeve also became the name of the actual garment itself. 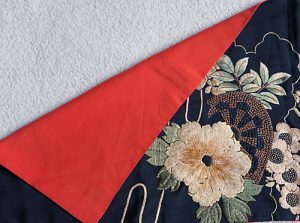 It distinguishes the married woman or older unmarried woman from the young who traditionally wear the “Furisode” (swinging sleeves) which is brighter, bolder and attracts attention to the wearer, something a married woman would not want to do. 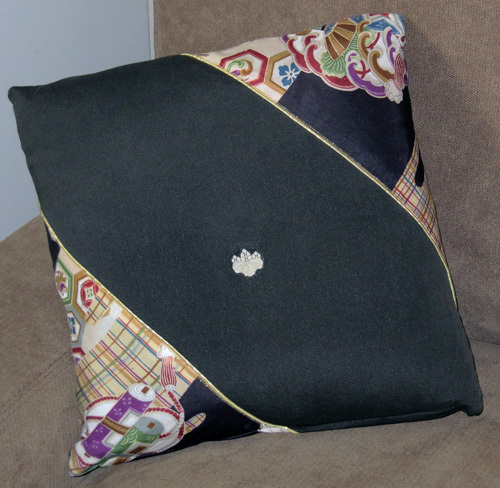 This striking pillow has been pieced together from an elegant garment that portrays a calm, composed and dignified presence with a subdued sophistication representative of the responsibilities of social adulthood. 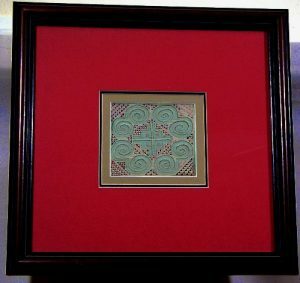 It has been hand stenciled using the Rice Paste Resist method of painting on Silk. This process required that each color be applied separately, while all the others were painted out in the rice paste. 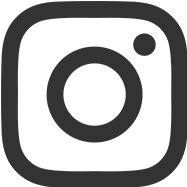 Each time a new color was added, the rice paste had to be removed by soaking it out over and over again in the local river water and then reapplied. This technique required a great amount of skill by the artist as well as being extremely labor intensive. Natural dyes were used on this hand woven Silk weave. Hand woven Silk Kimono with hand stenciled patterning. The pillow is in excellent condition while the colors are actually more intense than they appear in the photos. 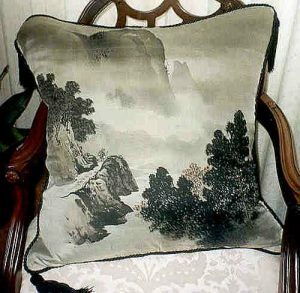 The Pillow has been pieced in antique Silk taken from a formal woman's Kimono, using both the solid and hand stenciled colorful portion of the Kimono for accents. 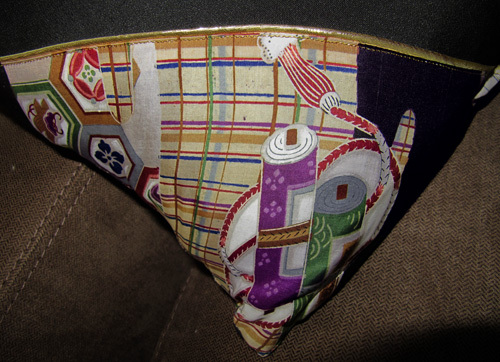 The pillow closes with a zipper that is covered with the natural silk. The Pillow is filled with a separate pillow in order to make cleaning possible. 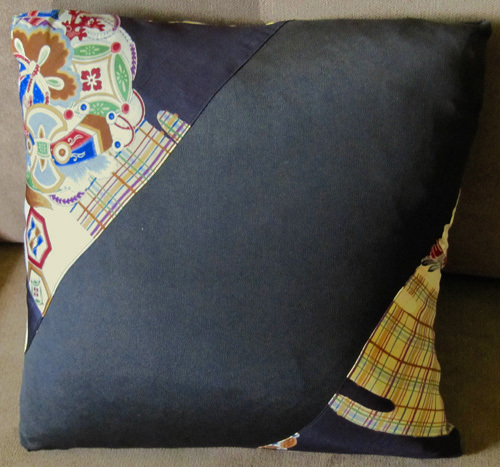 The gold trim separating the colorful sections of the pillow from the solid sections adds to the luxurious feel.